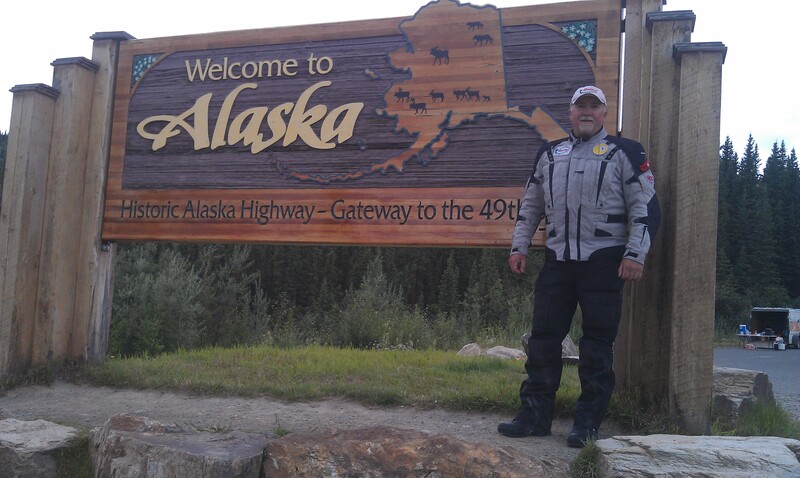 Sunday, 5 August 2012 Whitehorse, YT Canada to Fairbanks, AK (617 miles) Total Trip Miles – 4285. 11.25 hour riding time. While loading the bike this morning and after doing my overall bike check, I notice the chain play to be a bit excessive – made necessary adjustments. Have some concerns since this is the first time in over 9000 miles the chain required adjustment. At the end of today’s ride the chain required adjustment again and there seems to be some sideplay between the rear sprocket and chain as well some some play between the sprocket and wheel hub. As I rode out of Whitehouse there was moderate ran and the roads were covered with glacial silk which covered me and the bike with a light gray film….an absolute mess! On a more positive note, about 20 miles outside of Whitehorse I spotted a brown bear just off the left side of the road and as I turned around for a picture, he reared up on his hind legs and scented the air then darted into the woods for cover…pretty cool stuff. 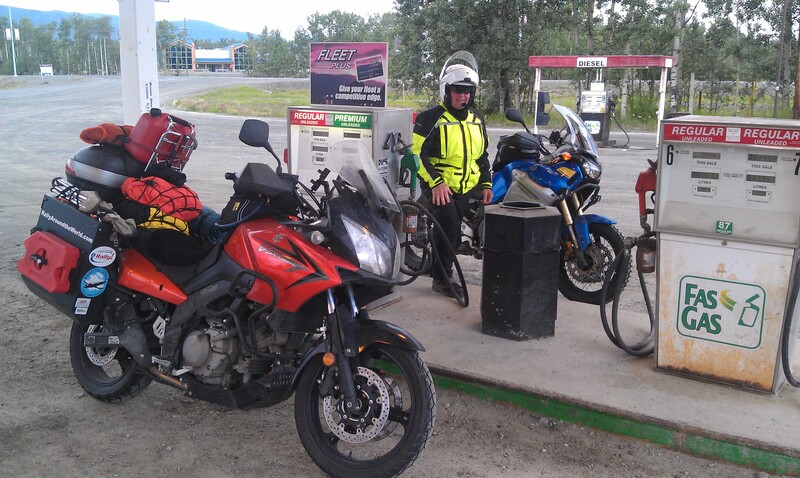 Briefly chatted with a rider from Eugene, OR named Fred Wilkinson who was also riding north to Fairbanks, but we ended up initially leaving Whitehorse at different times…I actually passed him as he was at a roadside marker pulloff and sounded my horn & waved only to later run into him at the first gas stop. Ed ended up leading our ride all the way into Fairbanks where we parted ways – he planned to spend and extra day in Fairbanks touring the city. Crossed the US – Canadian border at about 2pm local time…the last time I stood at this spot was early June 1973…brought back some great memories of a great time in not only my life, but the lives of my parents and brother and sister – Tye & Portland. Passed Quartz, Birch & Harding Lakes as well as the Salcha River – some great times fishing and boating those areas. Arrived at my lifelong friend Mike Kennebec from high school in Fairbanks and his wife Vicki’s home about 5:30 – she prepared a fabulous dinner that included key lime pie. Also got the opportunithy to catch up on some much needed laundry in their super, high-tech washer & dryer. Mike took me on a tour of the city and for the most part it’s the same as when I left some 34 years ago. 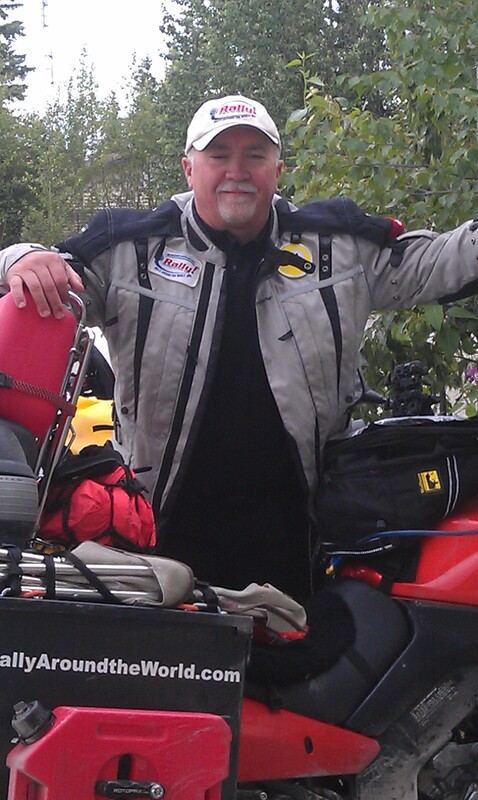 Chip…Thank you for thinking about me – have about 10,000 more riding miles to go!